You must be a member of the Los Angeles Explorers Group to attend this activity. Would you like to join this group? 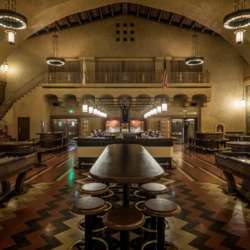 This Friday let's meet at the Imperial western beer company, a unique new bar in Downtown LA’s Union Station. Let's play shuffleboard, pool, or chess while sipping a drink in an unusual location. As usual feel free to join us anytime and to bring friends, but please ask them to join Internations!